Labor immigrants return from Russia to Tajikistan by the hundred to meet the New Year with their families. Experts from the Russian Federal Service of Immigration and Immigration Service of the Tajik Interior Ministry claim that practically every Tajik family has at least one Gastarbeiter coming home for the New Year celebration. Immigrants Day is celebrated throughout the international community (and in Tajikistan) on December 18. A roundtable conference took place in Dushanbe that day. Officials of the Tajik Ministry of Labor and Social Protection, Interior Ministry, Russian experts, and representatives of the World Immigration Organization attended the forum and discussed ways and means to prevent illegal immigration. Labor immigration from Tajikistan surged when the situation in the country rapidly and dramatically deteriorated in the wake of the civil war in this country in 1992. It was essentially a stampede, and particularly into the countries citizens of Tajikistan did not need visas to enter - Russia and all CIS countries but Turkmenistan and Uzbekistan. These latter introduced visa regimes as soon as the USSR disintegrated. 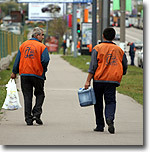 Immigration legislation in Russia was amended in early 2007 and the number of legal labor immigrants immediately soared to 200,000 (from 30,000 registered a year ago). This new trend notwithstanding, Gastarbeiters themselves claim that the situation in Russia and other CIS countries does not really change. Law enforcement agencies in Russia for example always find an excuse to accuse a labor immigrant of violation of the law and extradite him or her. Wage arrears remain regular. Moreover, employers all too frequently renege on their promises concerning size of the pay. "They usually pay us in cash. It's quite all right for them but not so for labor immigrants. One may apply for residence permit after several years in Russia. If, however, he has been paid in cash all these years, it is next to impossible to prove that he has faithfully paid taxes all this time," labor immigrant by name of Hurshed told Ferghana.Ru. "I finished school a year ago and went to Moscow to join my relations working at a construction site there. Well, I spent all these twelve months restricted to the construction site and never ventured outside because of my illegal status. Being an illegal immigrant in Russia is not fun, you know. Russian law enforcement agencies are suspicious and distrustful of immigrants and doubly so of illegals. They never hesitate to concoct an excuse and extradite one out of Russia. There are street punks as well to be wary of." "My fellow countrymen tell me that some of them encountered problems while in Russia, the problems immigration services there could help them with. Unfortunately, Russian immigration services cannot be bothered," Hurshed continued. "That is why Tajik workers always keep a low profile, they are always careful to remain out of spotlight. Just like slaves, you know. Everything just to hold on to the job. Because it is a matter of life and death for us... The Russians have simplified the registration procedures some. No need now to visit immigration services in person and waste time in queues there. One only has to mail a notification to immigration services nowadays. The receipt is accepted as a voucher afterwards. It made life easier. I'm not saying that all labor immigrants are lily-white or something. Some of them do end up in the underworld, but that's rare." Labor market in Russia is colossal and the redtape involved in obtaining the work permit remains overly complicated. It means that the demand is being met by illegal immigrants inexorably drawn to the "wild" Russian market. No Tajiks ever go to Russia to become rich. They all go there to provide for their families back at home. They take up jobs few Russians will ever touch. They are paid what by Russian standards constitutes a pittance, the sums one will never make ends meet on in Russia. For Tajikistan, however, the money is sufficient to feed a whole family. Illegal labor immigrants live right at construction sites or in cellars converted into barracks for whole teams. They venture outdoors but infrequently, for fear of encountering the police. According to the Immigration Service of the Tajik Interior Ministry, 1,850 citizens of Tajikistan were deported from Russia in 2007. Tajiks' reticence is a corollary of their position in Russia where they fall victim of regular police raids. Practically all experts maintain that host countries treat labor immigrants as something of no importance. Gastarbeiters themselves, recent fellow countrymen brought up and educated in the Soviet Union, put up with all the humanization and disdain. Lots of labor immigrants are people with institute or university diplomas. They understand the culture of the country they go to and speak Russian more or less fluently. On the other hand, Karomat Sharipov of the Tajik People's League admits that nearly 70% of the Tajiks seeking employment in Russia are illiterate. Izvestia quoted Sharipov as saying recently that the Tajiks frequently encounter trouble in Russia because they cannot read or write even in their native tongue, much less in Russian. Some labor immigrants nevertheless manage to legalize their stay in Russia and assimilate into society. Some even buy apartments in Russia despite their cost. According to experts, legalization of highly-qualified personnel is in the interests of employers themselves. Unfortunately, the quotas for the use of foreign labor force set by the Russian Federal Service of Immigration are way behind the actual needs of the market. This state of affairs does not promise a dramatic reduction of illegal labor in Russia in the foreseeable future. As a matter of fact, the market itself is the best regulator and whoever the Russian economy does not think it needs is compelled to leave Russia. That nearly 1 million Tajiks seek employment abroad every year is a sure sign of there being something wrong with the Tajik state itself. Neither are forecasts particularly optimistic. Professor Hojimahmad Umarov, a recognized authority on economic issues, assumes that a higher gas price coupled with soaring prices of electric power, housing services, petrol, communications, and foods in Tajikistan will boost impoverishment. "It will have a crippling effect on well-being and morale because prices keep soaring and wouldn't stop," Umarov said. It is hardly surprising therefore that so many Tajiks choose to seek employment abroad. Average monthly pay in Tajikistan is $36, minimum $3.75. Immigration is not going to dwindle therefore, and legalization of everyone eager to seek employment abroad is a sheer impossibility. Bulk of illegal immigration is not going to go down and all attempts to regulate it are doomed to failure. Lots of Tajik boys barely out of school pack up and leave for Russia nowadays. This exodus will only continue and whether or not they ever decide to come back is not a foregone conclusion at all. It should alert the authorities. The young, healthy, and strong leave the country, and national genetic resources deserve better than that. Either Tajikistan begins to take the problem seriously and undertakes to do something about impoverishment, or it will certainly find itself in trouble soon.